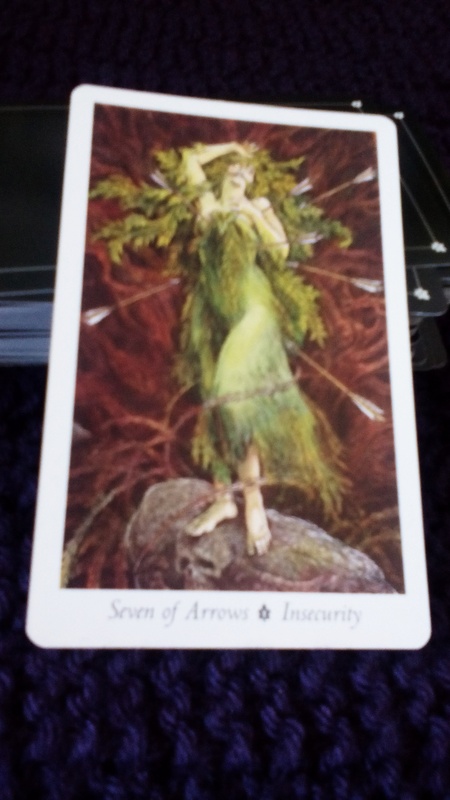 The Seven of Arrows (Insecurity) from the Wildwood Tarot. I began my work today by doing an exercise sent to me by James Wells–a small prequel to the Tarot Counselling class (click on the words “Tarot Counselling” if you are curious about it) that I am taking with him later this fall. James’ exercise called on students to cross the threshold into the realm of soul guidance, draw a card, set an intention for what kind of guidance we wished to receive, and look at the physical, emotional, and spiritual layers of meaning in that card. I set my intention to ask for guidance about my day ahead, and drew, from the Wildwood Tarot, the Seven of Arrows/Insecurity. This card shows a woman dressed in green, standing on a stone that has a skull carved into it, with seven arrows either flying at her or in the act of piercing her. It’s as if she is being executed by a firing squad, but instead of having bullets fired at her, she has arrows. She also has a gag in her mouth so that she can’t speak. She makes me think of Jesus on the cross, totally vulnerable, being sacrificed for the sake of others. Or of the Buddha, throwing himself off a cliff to be eaten by a tiger, as he does in one of the jataka tales. I think most women, at some point in their lives, can relate to this image, and not just because this is a picture of a woman. Women can relate to being on the spot, we OFTEN experience not being allowed to speak, we regularly experience occasions when we are targeted for being who we are, and we often make sacrifices that involve putting others first and ourselves last. I think that our typical reaction to seeing someone who is willingly in an overwhelming situation–whether it is a truly intolerable situation, like being literally on the cross, or a tolerable one, like trying to do too much too fast–is to say, please stop! Don’t you find, looking at this card, that you want the woman shown here to be safe and sound somewhere? Likewise, when you see Jesus on the cross, don’t you want to get him down from there? I do! I want him out in the world teaching, not suffering on the cross. And I don’t want to see women spending all their time taking care of others and not taking care of themselves, either, even if that is a much smaller sacrifice. Looking at the woman on this card, part of me wants her to turn into Wonder Woman, and quickly block all the arrows the way Wonder Woman blocks bullets with her bulletproof bracelets. I want her to speak up, fight back, and not allow her power in the world to be usurped. I want her to be a spiritual warrior, not a sacrificial lamb. So I am torn in terms of how I feel about this card and what it is saying to me. At the spiritual level, I feel that even the little sacrifices that women and men make in daily life are meaningful, and magical. Those small sacrifices may be choices that are imbued with deep intention. On the other hand, such sacrifices must be chosen willingly. So my question to you (whether you want to answer it in the comments section or in your own journal) is this: what sacrifices do you choose to make that you feel are meaningful? For whom are you willing to make those sacrifices? And what sacrifices, if any, do you think no one should ever make?